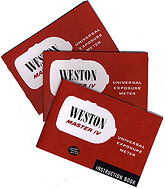 £139.00 UKP - For full details on Weston Master V click above. £139.00 UKP - For full details on Weston Euromaster click above. £139.00 UKP - For full details on Master IV click above. I am holding it in my hands. Stunning. My grandfather had one back in the 1960s. I wound up with it in the 90s but by then it had stopped working. I sold it along with a pile of Leica screw mount gear for a Hasselblad. It’s not just a light meter, it’s a time machine. Thank you. The Weston arrived by this mornings' post and I am delighted. The meter is exactly as you described along with a near new leather case instruction book and invercone also in a case. The instruction book has revealed several things about the Weston of which I was not previously aware. Thank you for your excellent service. The Weston Master IV arrived three days ago. It is a beautiful instrument. The IV is visually even more elegant than model V and Euro-Master, - and the scales are more readable I think. So thank you for helping me put the photographer back into my photographs. on the web... great ! repair them still and about how much would it cost? I brought mine when starting work in 1975 and cost £29.95 from the then famous Euro Photo Centre at Cowley. Would love to have it servicable again. Do you please have any instructions and case for the above light meter. How does this meter compare with the Master V ? the two case halves tends to split with use. half twist from ones' thumbnail. This is less practical than the IV. The Invercone of my trusty old Weston Euro-Master is cracked and missing a "bit". I read that you had a number of old meters "for parts" and/or future re-celling and was hoping that you mught have an spare Invercone you'd be willing to sell to someone in the States. invercone and post to you by Royal Mail Small Packet Airmail on Monday. I will send a Paypal Invoice for $12.00 includes shipping. You're the expert -- I can send you a photo of the meter if you'd think it necessary to be sure "which" Master I have. On the "screen" it says "WESTON Euro-MASTER" (the "Euro" being slanted/italic). The serial No. stamped on the back is "8643 M"
I purchased the meter new in London late in 1973. I had just started a 3 year course at the Harrow College of Technology & Art (now the "Harrow Campus" of the University of Westminster). Side story: At a camera shop down "somewhere in center London", I'd gone "shopping" with 3 fellow students. We were at the register and I was paying for the Weston and several 2 1/4 stainless film developer reels when a limo pulled up in front of the store and Peter Sellers ran in. He dropped about 20 rolls of 35mm colour film on the counter -- they were to process and print everything as 10 x 8's as usual -- he smiled at us and was out the door and off in his limo. As students, we were shooting B&W, making contact sheets of already edited negs and only printing the absolutely best images on precious 10 x 8 paper --we were aghast at Mr. Sellers' waste and extravagance! being made 'ex-works' from the old boy himself. I just wanted to let you know that the Invercone arrived safely (congrats on your packing!). The mailperson put it right in our roadside mailbox so I didn't even have to make a trip to the Post Office ...and there were no forms or affadvits for me to sign. Thank you again for your help. It was important that this bit of my "history" be working. Very pleased the invercone arrived safely. The first sale on this 'ip-com' website! Just to let you know that the meter did arrive on Saturday but I missed the post lady, so I collected it yesterday from the sorting office. All very well packed. I have checked it quickly and the needle seems very lively, which is great. The first opportunity to use it with the Hasselblad will be next weekend, so I am looking forward to that. Thank you very much for your prompt service. I now have three Master Vs (!) - of the other two, one has a sticking needle but a good cell, the other one has a weak cell but a good movement. Do you think it would be possible to combine the two and make one good one? much for this beautiful and in perfect working condition meter. you get any earlier Westons or the uncommon Ranger or Master 6. 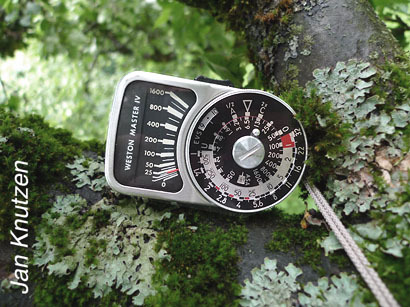 I just bought the Weston IV meter from your site...read what you wrote about the better design of the needle lock switch and so made up my mind. Also it looks a lot easier to read than the V. Thanks again Ian! a thumb nail when locking it. fully restored meter kit via Special Delivery. The meter arrived earlier today as promised and I am very pleased with it, the condition is much better than I had hoped. Now to use it! Thank you for the very prompt service. It has been a pleasure dealing with you, and I am already wonderign whether I should get myself another Weston as a backup!